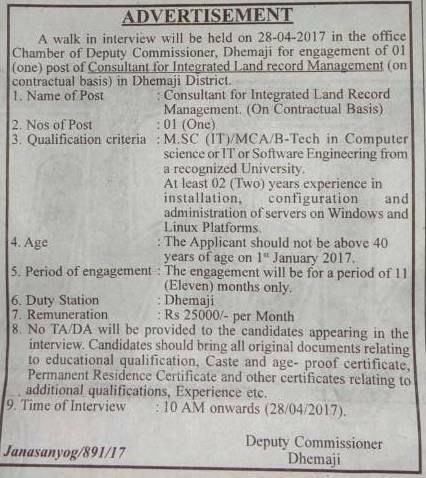 A walk in interview will be held on 28-04-2017 in the office chamber of Deputy Commissioner Dhemaji for the recruitment of Consultant for Integrated Land Record Management on contractual basis in Dhemaji district. Age : Candidates age should be above 40 years as on 01-01-2017. Educational Qualification: Candidates should have M.Sc (IT)/ MCA/ B.Tech in Computer Science or IT or Software Engineering from a recognized university and at least two years experience in installation, configuration, administration of servers on Windows and Linux Platforms. How to Apply: Eligible candidates can attend for walk in interview along with all original documents relating to educational qualification,caste and age proof certificate, permanent residence certificate and other certificates relating to additional qualifications, experience etc. on 28-04-2017 at 10:00 am.